In the market for a new mattress and just can’t seem to find the right one? Well say hello to the new Bruno mattress. Bruno is a company who prides themselves on creating a high quality mattress at an affordable price. Does Bruno have what it takes to make a name for themselves? Continue reading to find out! In a bit of a hurry? Click here to scroll down to the review summary. 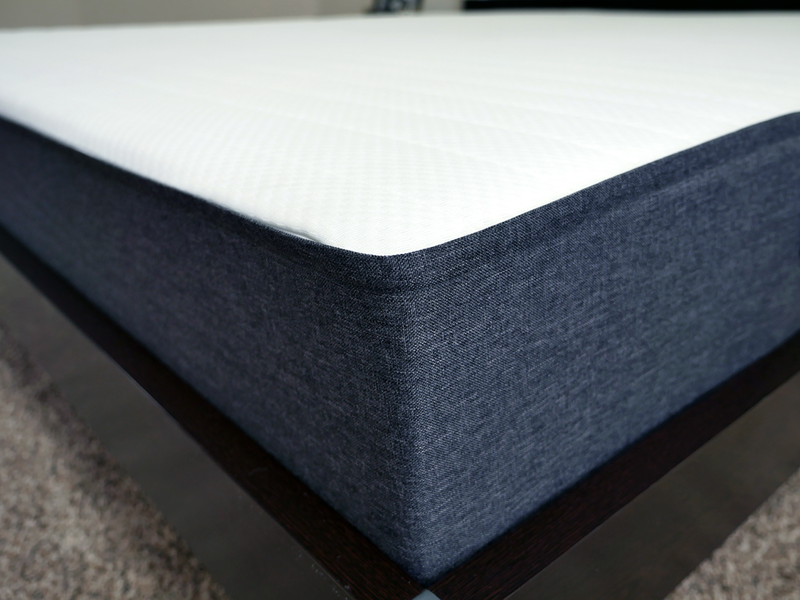 The Bruno mattress is 10” thick and made from 2 separate layers. 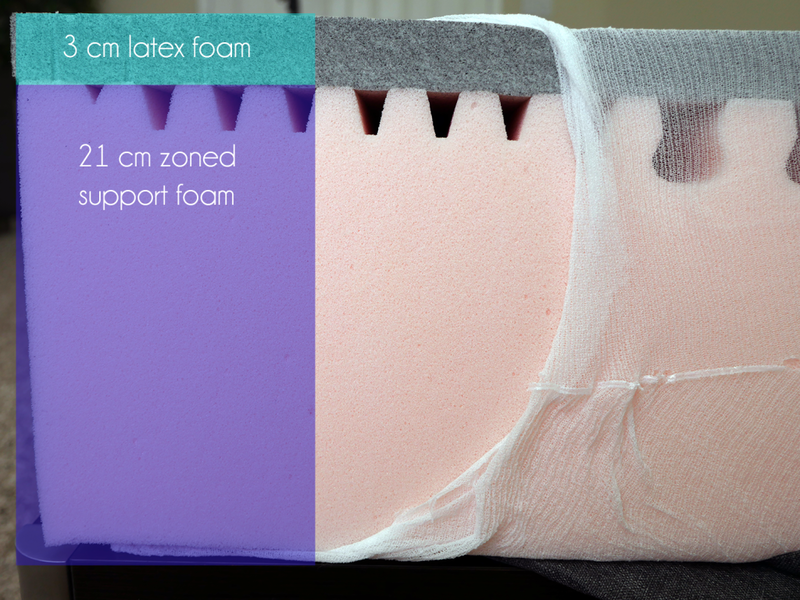 Top layer (comfort + cooling) – 3cm of latex foam. Latex is designed to provide comfort, support, and pressure relief for the mattress. Additionally, it doesn’t retain heat like memory foam, keeping the sleeping surface cool. Bottom layer (support) – 21cm of polyurethane foam. This layer is designed to act as the support for the mattress along with maintaining the overall shape of the mattress. The Bruno uses a 7-zone system on this layer. This zonal system creates more support where you need it and less where you don’t, keeping your spine in better alignment. The cover of the Bruno mattress is made from a polyester fleece blend. With a luxury top layer the cover is able to assist in providing pressure relief for sleepers. In addition, the cover has two handles that are sewn onto either side of the mattress to help make moving the mattress easier. Aesthetically speaking, the Bruno uses what has become the staple design for mattress covers. The grey sides and white top have become a very popular design, but Bruno has done a good job giving their cover a bit more of a polished feel with the tight stitching, top zipper, and handles. The two most notable features with the Bruno’s cover are the handles and the ability to remove and wash the top piece of fabric. Handles help protect the mattress during transportation and setup. A removable cover is a bonus as well. No need to spot clean, just remove the cover and toss it in the washing machine. 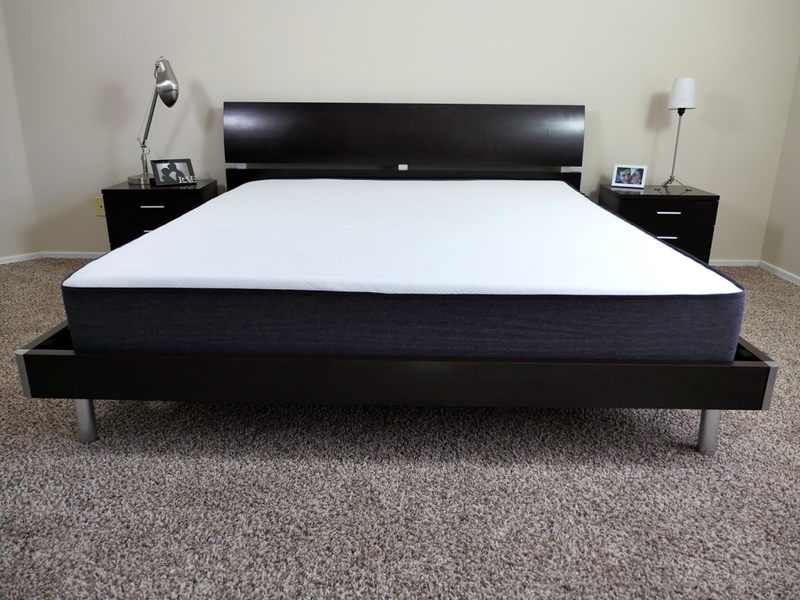 The Bruno mattress receives a 7-7.5 out of 10 on the firmness scale, with 10 being the most firm. With a top layer of latex, the Bruno provides somewhat of a different feel. Traditional memory foam mattresses typically offer a more pronounced contour around your body, meaning the foam form more directly to your body’s shape; with the latex layer there is more of a rounded contour and a generalized depression. Both your body and the surrounding area will sink in, creating more of a small bowl in terms of sinkage and hug. This mattress provides the sleeper with more of a floating feeling as opposed to sinking and feeling restricted or trapped by the foams. Instead, they will feel like they are resting on top of the foam layers below. The support of the Bruno mattress is very good. One of the most unique attributes of the Bruno is the zonal support. This is not something I’ve ever seen in another foam mattress. The zones help to create more support where your body needs it and less where it doesn’t. This allows your spine to be more properly aligned and creates extra pressure relief in critical areas. With regards to cooling the Bruno’s design, materials, and feel all help to maintain a comfortable temperature. The top layer of latex is aerated, allowing for optimal breathability in addition to improved airflow in and out of the mattress. The thin cover also helps to improve cooling. Lastly, the firmness level of the Bruno creates more of a floating feeling on the mattress. Being less enveloped by foams further improves airflow around your body. Finally, bounce. The bounce of the Bruno is above average and definitely worth mentioning. Once again, the top layer of latex does a great job of responding when pressure is applied, allowing couples to enjoy intimate activities more. You give up a little bit of motion transfer with the Bruno’s design and materials. Sleepers who are easily awoken by their partner may be better off with a 100% memory foam mattress, but for those with average needs the level of motion transfer should not be a major detriment. Lying on your back – as I lied down on my back with my weight spread evenly across the mattress, I saw 1.3-2.5 cm of sinkage. Lying on your side – while lying on my side, I saw 2.5-3.2 cm of sinkage. Sitting on edge (conservative) – in a normal sitting position with my bottom slightly further back on the mattress, I saw 3.8-5 cm of sinkage. Sitting on edge (aggressive) – as I sat on the direct edge of the mattress, I saw 10 cm of sinkage. Standing in the middle – with all of my weight placed at one point on the mattress, I saw 10cm of sinkage. Who should buy the Bruno mattress? Want a slightly firm mattress– the Bruno comes in at a 7-7.5 out of 10 on the firmness scale, where 10 is the most firm. Want good support – the Bruno offers solid support all across the mattress. 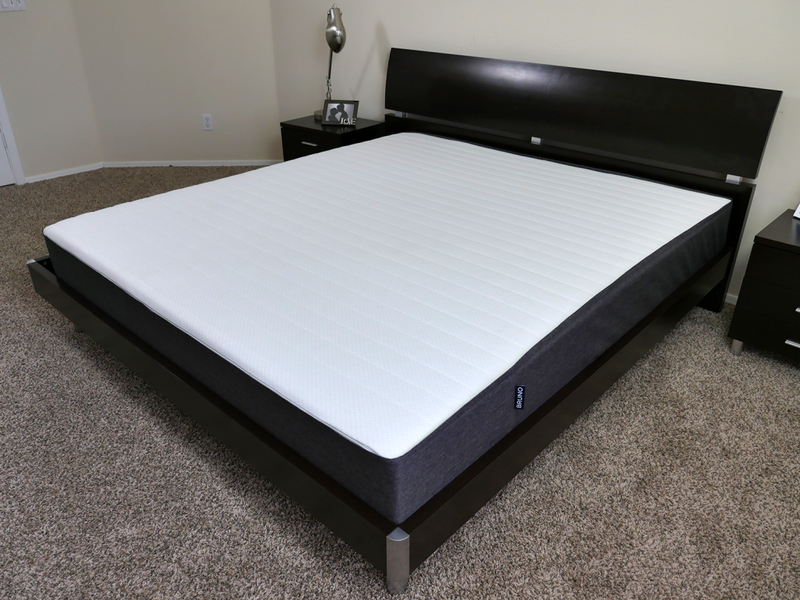 Side, stomach, and back sleepers have the ability to enjoy this mattress due to the top layer of latex and the consistent spinal alignment received in all positions. The 7-zone support foam further improves the feel and support level, especially for heavier sleepers. Want good response time – with a top layer of latex, the Bruno is very quick to respond when pressure is applied. This helps to avoid any sort of stuck or trapped feeling by the foam layers below. Want good bounce – bounce is definitely a top characteristic with this mattress. Although foam mattresses tend to struggle with bounce, the Bruno does a good job of pushing back on the sleepers and creating bounce. Looking for more information on the Bruno mattress? Visit Brunosleep.co.uk. The Bruno mattress has a slightly firm feel at a 7-7.5 out of 10 on the firmness scale. Great support from a 7-zoned foam support layer + solid bounce, cooling, and comfort form a top layer of latex. Ideal for sleepers less than 110 kg (heavier sleepers may bottom out the mattress). Overall, great construction and good build quality. A strong choice for those sleepers who enjoy the floating feel and fast response.